Remember back in the day when cork screwing was labor intensive and occasionally ended up in embarrassing moments of the screw ending up on someone’s forehead? Well this is no longer the case. Wine is the essence of any party and mostly a conversation starter. There is a reason as to why guests are served with wine the moment they walk through the doors. It is very relaxing and welcoming and opening up the bottle with class makes the experience even better. Gone are the days when wine cork openers were bulky and dangerous especially to minors. The Ozeri Nouveaux Electric Wine Opener with Removable Free Foil Cutter has proven itself to be what wine lovers were waiting for. This wine opener comes in a fancy design that allows it to stand independently on the table. It oozes elegance and comes in a variety of colors. There is no better way of adding style to your dinner table or even than with this wine opener. 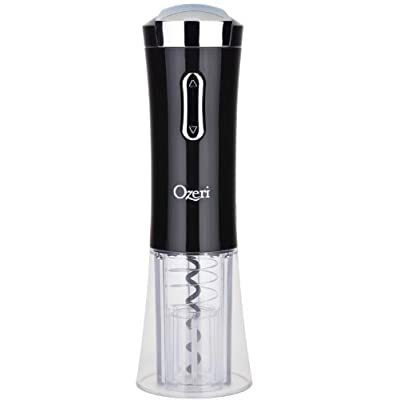 The bottom part of the Ozeri Nouveaux Electric Wine Opener with Removable Free Foil Cutter is colorless/clear which allows you to view the cork removal process. This is so exciting especially to guest as the wine opener springs up more and more surprises. The top back is colored; black, red or silver while the bottom part is clear for this purpose. It is always exciting having to see how technology works first hand. It is an ideal choice especially if you’re using the wine opener professionally as it is definitely bound to entertain your customers. The Ozeri Nouveaux Electric Wine Opener with Removable Free Foil Cutter is cordless for easy transportation and storage. Technology today is more focused on making devices and appliances easier to use and efficient. 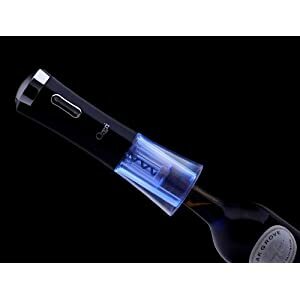 The wine opener is rechargeable and adds to convenience as it can open up to 40 bottles non stop before needing to be recharged. This allows to you carry along your wine opener to a trip or event without having to drag along its charger. It also adds to convenience as you do not have to keep checking on the charge especially if it is for your home use. This special feature comes in handy for professional use as the waiter doesn’t have to drag along a corded device from table to table. Its design makes it easy to fit even into your pocket. The clear bottom part illuminates a calm blue color light while charging or when in use which is so entertaining. Chances of acquiring blisters are absolutely reduced by the ease that comes with holding the device. It comes in a sleek shape that easily fits in to your hand perfectly. This is an ultimate choice for you especially if you have members of your family suffering from arthritis. Its features make it easy for them to use and handle without needing extra help/ assistance. Due to its efficiency and sleek design, the Ozeri Nouveaux Electric Wine Opener with Removable Free Foil Cutter is not restrictive and can be used for home or professional purposes by anyone. It works on all types of corks even the long ones hence all rounded for convenience. Easy to use – The Ozeri Nouveaux Electric Wine Opener with Removable Free Foil Cutter simply works at the press of a button. Portable – It is light in weight and small in size making it possible for one to carry around. Maintains power – The initial charging takes about 8hours which then supports opening of up to 40 wine bottles. Attractive – This wine opener has a sleek design and an illuminating blue light that is unique and adds to its beauty. The foil cutter easily breaks. This might be so due to the fact that it is made of a plastic material but it doesn’t affect the functioning of the wine opener. It works perfectly fine and gives you the same quality service as before. Based on the many positive reviews and feedbacks from customers that have used the product before, the Ozeri Nouveaux Electric Wine Opener with Removable Free Foil Cutter has proven itself as a worthy investment. Its speed in opening bottles, ease of use and longer power storage gives you value for your money. This product is easily available online and especially in Amazon for a reasonable price. There are many customer’s reviews and comments about the product that will enlighten you and help you understand more about the product.